This delightful Father's Day indoor Chinese Elm bonsai tree has an elegant, twisty trunk and neat pads of lush green foliage. The lovely 'Happy Father's Day' plaque label looks excellent on the beautiful blue bonsai pot, and makes this the ideal gift for Father's day. 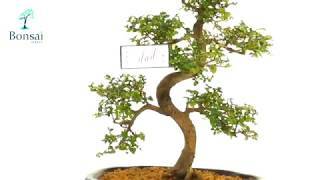 The Chinese Elm is easy-to-care-for, and the bonsai tree is perfect for setting your dad up in the art of growing bonsai. Add a free gift message and choose some gift wrap from our wide range to make this the perfect gift for your dad. Choose your prefered delivery date in the checkout. Happy Father's Day plaque label for this special occasion.